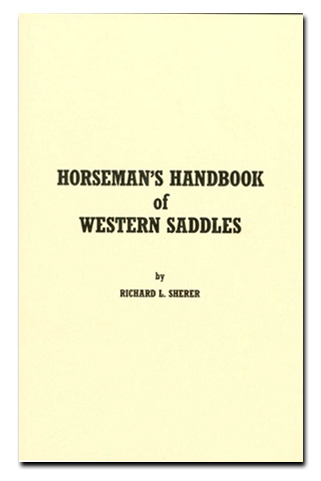 In the preface, the author states, "The purpose of this book has been to provide novice as well as seasoned horsemen with the factual information necessary to evaluate the quality of western saddles." To that end, Sherer has produced a handy guide to saddle selection. Carefully he guides the reader through the saddlemaking process. He uses lots of photos and drawings, and starts the book with detailed information about the saddle's foundation, the tree. This includes the bars, swells, gullet, cantle, and horn, and the rawhide covering. There are diagrams on saddle measurements and descriptions of different styles. Next, he gets into the details of western saddles - including all the leather parts, designs, and styles. There is a good discussion of riggings, skirts, seats, fenders, stirrups, and padding. Part three discusses dressing up the saddle with stamping, carving, and trim, and part four tells how to maintain the saddle in good condition. This is an excellent handbook. Email is not a secure way to send credit card information.